I have a secret. An embarrassing statement. An addiction. Please don’t judge me. Let me explain. At the beginning of the year, I put on a show called Better Than Grisham. There was storytelling by me, comedy by Monica Hamburg and music by Arlene Paculan. We performed at The Belltower Cafe, which is literally in a Lutheran Church. Like, our stage was the pulpit. It was great fun. The seed for the show started with a podcast. John Grisham, one of the most successful authors ever felt he needed to join the self-promoting that every writer has to do nowadays and so he started a podcast. It was not good. Grisham didn’t seem to understand what a podcast was and didn’t know why he was doing it. He revealed his sexism and misogyny and just how out of touch he is with his audience. All this being said, it was incredibly addictive. Like, I became obsessed. It was like listening to a massive train wreck unfolding in your ears for an hour at a time. 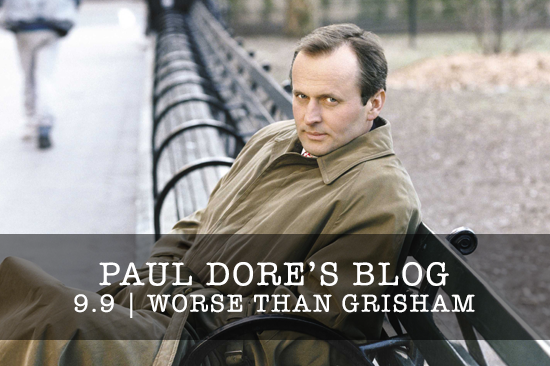 Grisham and his podcast were ripe for making fun (go listen to it yourself here). We based our live show around this and all along I believed I was just punching upwards. I hadn’t really read a lot of mass market fiction since I was a teenager and honestly, could be quite pretentious about those kinds of authors. The book Grisham was promoting on his podcast was Camino Island and I read it before the show, convincing myself that it was purely for research. The only problem was that I really enjoyed it. The sexism and archaic views on culture were there, but these references were so ridiculous and outdated that I couldn’t take most of the book seriously. But damn, I read it fast. Camino Island was my gateway drug. For my show, I had picked up a bunch of used Grisham books to help dress the set. I offered them to the audience, but there were not many takers. So, I was left with a handful of Grisham novels. One day I picked up Rogue Lawyer and started reading. The truth is, I’m embarrassed to say, that this book was so outrageous that I couldn’t put it down. After finishing all the used books from the show, I borrowed The Rainmaker from the library. Part of my interest was that the movie version was made by Francis Ford Coppola. I breezed through that 700-page book AND watched the movie. Since then, I’ve read almost fifteen John Grisham books and am not slowing down. Like, they are not good and they start to all sound the same, but I can’t get enough. After my third book, I started to realize what they were doing to me. They were relaxing. They forced my mind to stop churning. Anxiety levels lowered. If I was restless or getting up in my head, I’d sit and read ten minutes of Grisham prose and I’d calm down. You know there is going to be a main character who is good, antagonists that are bad, some mild violence and a convoluted plot. That good guy is going to win. He’s going to win in a way that really screws the bad guy. Win in a way that is not plausible, but which makes you deeply satisfied. You know exactly where you are and where this is all going and how it’s going to end. From Grisham, I’ve even dipped into my favourite as a teenager -Dean Koontz. Stephen King is next. Sure, I’m still usually reading one of my high-minded novels alongside, but for the moment, I always have a Grisham book on my phone. I carry him with me everywhere I go. My name is Paul Dore and I am an addict.